Some in depth info on our problem with PLASTIC. We begin with our role. We buy big plastic bins and jugs and bottles and baskets. They break and we toss them out. Plastic does not biodegrade, but it will photodegrade, or weaken under sunlight and the form becomes brittle and breaks up into macro plastics like you see here. 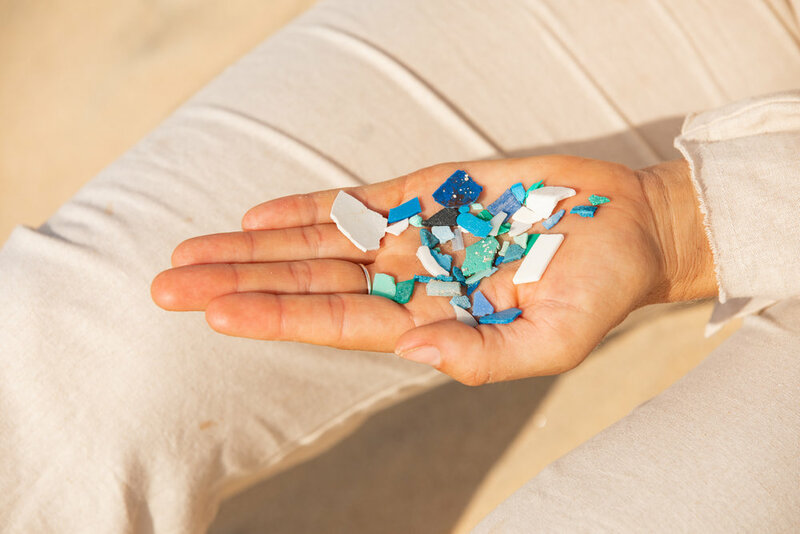 Plastic continues to break UP (not down, like organic material) into millions of tiny pieces, microplastics (less than 5mm) and eventually, nano plastics. These do not go away just because we can no longer see them. They are washed out to sea. They seep into soil and are impacting water retention and crop growth. They are ingested by plankton then eaten by fish and bioaccumulate up the food chain. They float in the air we breathe. They are more densely found in our lakes than our oceans. Microplastics have been traced to human stool (the study estimates more than 50% of humans have plastic in their excrement!) Found inside internal organs of earthworms. Found in beer and soft drinks and bottled water! An invisible invasion on the micro scale that will cause damage, but what kind? Ingested microplastic particles can physically damage organs and leach hazardous chemicals. Plastics are a trifecta of toxic when it comes to leaching. They are made up of base ingredients, such as the infamous hormone-disrupting bisphenol A (BPA). Then there are the chemicals that are added to the base plastic during production to give it various characteristics (hard, soft, malleable, translucent,etc), called phthalates. Thirdly, the environmental pollutants like pesticides that are attracted to the surface of plastic. Our bodies could handle microdose of these toxins, but when plastic is in our clothes, packages our food, our drink, our toiletries, when it's in our water, our fish, our soil...this will build up in our bodies. Specifically since these chemicals are lipophilic, they will hang out in our fat stores. What do they do? In a nut shell, compromise immune function and stymie growth and reproduction. Who needs fertility anyways?? Studies show fish exposed to microplastics reproduce less but their offspring, who weren’t directly exposed to plastic particles, also had fewer young, suggesting the effects can linger into subsequent generations. Our friend @prigi in Indo is finding the fish in the Brantas river (of which millions of people rely) intersexed, or with both genitalia. If you are curious to learn more, I have interviews on my youtube channel with Dr. Anthony Jay who wrote "Estrogeneration: How Estrogenics Are Making You Fat, Sick, and Infertile." These persistent organic pollutants (POPs) are organic compounds that are resistant to environmental degradation through chemical, biological, and photolytic processes. They accumulate up the food chain, potentially impacting whole ecosystems, including the health of soils in which we grow our food. THIS IS WHY I QUIT PLASTICS.